We have had the pleasure of working with a group of team leaders and supervisors within a high-tech business for the last year. As the program draws to a close, I have been reflecting on what changes we have helped to initiate, and what delivered the most significant change for the participants and the organisation. There were many elements incorporated into this program and I’d like to think that they have all been useful, however one element may have had a greater impact than others. I believe that developing a sense of common purpose among the participants is what has made the biggest difference; the program participants chose to come together to influence the culture of their part of the business. This team has been developed across different functions and has formed into almost a new layer of management that spans the organisation. It’s not a formal layer, but it is having a big impact. This team’s aspiration is to nurture a workplace culture that has everyone making a fair and equitable contribution, reduces stress, and makes them masters of own collective destiny. Although it is a simple idea, it was not easy bringing this group of nine people together as a true team. What was getting in the way of being a true team? An initial obstacle in developing this group into being a “true team” was that the participants already saw themselves as a team that worked together cooperatively. They viewed teamwork as a description of whom they reported to in the organisational chart. In actuality, they were functioning as a work-group with the business division manager making most decisions and managing the team members on a one-on-one basis. This held them back them from being able to see “teaming” as a verb, and what could be possible if they adopted this perception. A true team then is very different to a group of people who appreciate the values of teamwork such as cooperating with each other, being respectful etc. That is to say, that the act of is not the same as the values of teamwork. It’s easy to think that people will jump at the chance to be part of a true because the benefits of a team appear so obvious. We often use sporting analogies to illustrate these benefits. For example, the sense of shared accountability and responsibility; the buzz that comes from achieving goals together that could never be achieved alone; the thrill of hearing the final siren and lifting that premiership trophy above your head as ninety-thousand supporters fill the stadium with your team song after a drought… Sorry, my husband is a Richmond Tigers supporter and I’ve been hearing about this literally every day for the past six months….! Being on the outside considering the prospect of being in a true team is not always as enticing as you might initially think. Traditionally, employees are assessed on their individual performance. This may make people hesitant to commit their future career prospects to a group of people that they suspect have their own self-interests as their highest priority. Trusting others with your future is a big decision. What if you feel someone isn’t pulling their weight? Or that they’re less capable than you? These questions point to some of the skills that are required by a true team. Deciding to is a big decision that is not easily made. It requires a mindset shift from achieving individually, to seeing that the only way to make progress on issues that matter, is to commit to the team. They need to shift from a predominantly “I” focus to a “we” focus. This shift doesn’t mean that the “I” disappears. In fact, as the team depends on team members offering their own unique strengths and capacities to the team, each individual can be more of themselves in a team because you can rely on others to pick up in areas of your “weaknesses”. 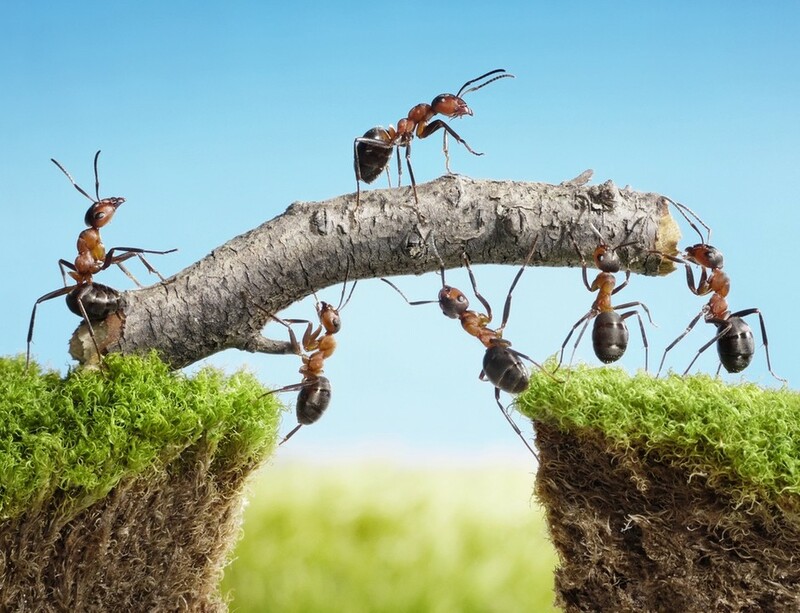 Becoming a true team is a big adaptive challenge. It’s not as easy as it seems. But the benefits are huge when people choose to work in a team. In our current client’s case, choosing to work as a true team has resulted in an increased sense of possibility; and responsibility and accountability within this group of team members. There is a stronger sense of optimism and determination to be masters of their own density, rather than reliant on the executive team. That doesn’t mean this team is at loggerheads with the executive team. It does mean that, rather than passively turning the wheels of the business, this newly minted team are working with the executives to shape the wheels. There is also a sense of something being made “whole”. Those in this business may not adopt such a word, but I am observing more smiles and a more joyful sense of what can be achieved together. It’s what we see when people feel a strong sense of common purpose. When people are divided into silos and individual accountability, we deprive them of something powerful. We deprive them of participating fully as unique individuals; “I’s” with their unique combination of strengths and foibles. To be individually accountable they have to conform to some type of homogenous form of a well-rounded person. We also deprive them of drawing on the strength of others and genuinely collaborating to find new, creative ways of responding to various challenges. There is something wholesome, liberating and healing that is a part of being together and teaming delivers that experience. ← How can we nurture visions?